Sam Walton opened Walton's 5&10 in Bentonville, Arkansas on May 9, 1950. The first store to officially bear the Walmart name opened in Rogers, Arkansas in 1962. It was financed 95 percent by Sam Walton himself. He was 44 years old at the time. Walton was known as "Mr. Sam" throughout his tenure at the helm of his empire. His mission statement for the first Walmart in Rogers, AR was, "The lowest prices anytime, anywhere." The concept worked. Walton and his family were the proud owners of 24 stores in five short years, achieving $12.7 million in sales. Two years later (in 1957), the company became incorporated as "Wal-Mart Stores, Inc."
But maverick entrepreneur Walton wasn't done yet. He wanted his stores in the national spotlight and, in 1970 Walton brought Walmart public with shares offered at $16.50. By 1972, Wal-Mart Stores, Inc. had 51 stores and sales had skyrocketed to $78 million. By 1980, Walmart's 51 stores increased to 276 stores and annual sales reached a benchmark of $1 billion. Moving forward, Walmart opened it's first Sam's Club – a chain of membership-only retail warehouse clubs – in Oklahoma in 1983. The first Walmart Supercenter opened in Missouri five years later (in 1988). Seven short years after that (in 1990), Walmart became the #1 retailer in the United States, a position it holds today, in 2018. Sam Walton died in 1992 at the age of 74 but Walmart's headquarters are still located in Bentonville, Arkansas where the entrepreneur started it all. Walmart's current mission statement and its advertising slogan are the same: "Save people money so they can live better." Open Door Policy: Managers' doors are open to employees at all levels. Sundown Rule: Employees should answer all customer and supplier questions on the same day the questions are received. Grass Roots Process: Walmart strives to capture suggestions and ideas from the sales floor and front lines – and to implement them. Three Basic Beliefs and Values: Respect for the individual, service to our customers, and striving for excellence are cornerstones of the business. The 10-Foot Rule: Making eye contact, greeting people, and offering help to customers who come within 10 feet of employees is a 24/7 rule. Servant Leadership: Leaders are in service to their team, not vice versa. 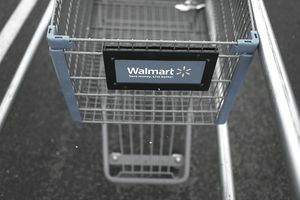 The Walmart Cheer: This is an actual, structured chant that was created by founder Sam Walton to lift morale every morning. He got the idea after visiting a Korean manufacturing facility in 1975. In January 2018, Walmart announced plans to increase the starting wage rate for all hourly associates in the U.S. to $11, expand maternity and parental leave benefits and provide a one-time cash bonus for eligible associates of up to $1,000.